In Lansing, Iowa, the parks and recreation department removed some playground equipment due to safety concerns. That’s when the Lansing Lions Club stepped up and to action! They formed a committee and did their research. They researched what type of equipment was needed and address the safety factor as well as handicapped accessibility. They applied for a grant and received $10,000 from Arlin Falk Foundation and they were off and running. They received approval from the city parks and recreation department and it was suggested the new playground have a river theme. 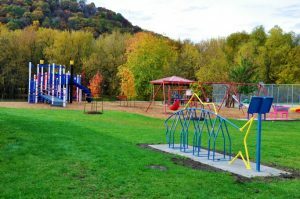 They had a goal to raise $98,000 and, with the help of various organizations and a $20,000 grant from Wellmark the new playground became a reality! A multi-activity piece of equipment in the shape of a Mississippi River Steamer was chosen along with many benches, a handicap accessible picnic table and bicycle racks in the form of fish. In September the Lions and many in the community came together to build the new playground. 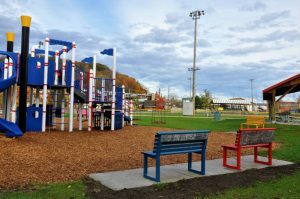 New equipment, refurbished swings, new concrete paths, picnic tables and benches and trees now decorate the shiny new park area. Even when the project was just finished and the tools were being put away the kids of Lansing couldn’t wait any longer and were given permission to HAVE FUN!